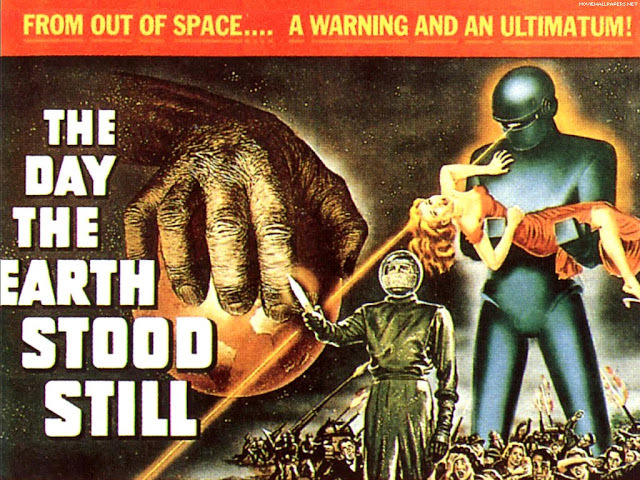 The Day the Earth Stood Still (1951) is often considered one of the greatest films of all time. The military notes that an object is traveling through the atmosphere at 4,000 miles an hour. Soon, the news is broadcast all over the world causing fear and excitement. The craft lands in a field in Washington D.C. and is soon surrounded by soldiers and tanks. It remains still for two hours before a spaceman emerges. He states that he's come in peace and needs to speak to the president. As he removes a device from his suit, a jittery solider shoots him. He recovers in the hospital after revealing that the device was a gift and that he has a message that he needs to deliver to all the leaders of the earth. This film has survived for sixty years and will survive for another sixty. It is clearly a product of its time, but its messages are timeless. This film takes most of the intriguing parts from the short story and elevates them using some brilliant yet simple touches. Klaatu aka Mr. Carpenter is our hero this time around. He's not entirely open to us though. The film keeps his mission a secret only revealing small sections of it to those he trusts. The simple brilliance of Klaatu is that he acts like a decent human being. He is in awe of the great symbols of freedom around Washington D.C. and what they represent. Despite being from space he is the most human character in the film. Bobby Benson is Helen's son and he's a very stereotypical fifties kid. He is critical to the plot and much less annoying than some other kid characters, so I give him a pass. Professor Jacob Barnhardt is the world's leading scientist. After Klaatu's parley to earth's governments fails he turns to the scientists through Professor Barnhardt. After convincing him by helping him with an equation he agrees to help. I think the most telling,thing, especially today, is the professor sating "we scientists are too often ignored." More true now than ever. Gort, much like Gnut, stands as a terrifying mystery until the end. Gort's actions make much more sense than Gnut's, even though they are theoretically completing the same objectives. Humanity's own fear, greed and strife are the central villain of the piece. These are spread over several characters in order to create the feeling that these vices reside in all of us. From Secretary Harley's scoff about gathering the world's leaders to Tom Stevens' short sighted greed. There's even a great section where the news completely ignores Mr. Carpenter when tries to make a rational comment. This film picks out what makes humanity great and what makes it terrible. The film is clearly set in its time. It features doctors smoking, boarding houses, and parents being fine with a stranger watching their kid for a day. These things create an interesting look back at a simpler time. There are some great shots of Washington D.C. and the surrounding area that are beautiful and brilliant. There's also the familiar grip of cold war politics, though this gives a much more even treatment than many other films. Also, unlike many of the other films I've reviewed, I had a difficult time choosing only a few screenshots. This film is masterfully shot! The end is not the earth shattering finale that today's sci-fi blockbusters thrive on. Rather it's is a simple speech with a simple message. It is now considered a classic finale and definitely stands the test of time. The ideas of government mistrust, news spreading fear, and the power of greed are more relevant now than back then. However; the message that humanity can overcome and move past these stumbling blocks is just as powerful. What prevents it from being perfect is that it has to oversimplify at points and that the Bensons don't get as strong characterization as they probably could have. However; this is one of those films that I feel should be seen by everyone. "Klaatu barada nikto" my friends. "Despite being from space he is the most human character in the film". Perhaps "most humane" rather than most "human"?